In light of Cornflower's post yesterday I've shuffled this book up the list a bit because you will see that it is all a lovely example of telepathic blogendipity at work so do head over to Cornflower and take a look. Nowhere in The Concert Pianist blurb is any mention made of Conrad Williams' musical pedigree though I make the assumption that he must have one somewhere. Grade Eight piano or music critic of the something-or-other surely, because he writes with such complete confidence about a world that to me at least would have remained remote,strange and mysterious unless you've been on the inside. 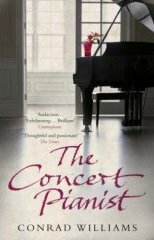 Here's a book for all music lovers everywhere, all concert goers, all pianists from pub to Wigmore Hall and everything in between, a book that takes the lid off the piano and lets us in on the workings of the rarified atmosphere of the concert pianist. A series of lack-lustre reviews have flayed the increasingly fragile confidence of world-renowned concert pianist Philip Morahan. Fifty-two, unmarried ,childless and seemingly incapable of sustaining any relationship beyond that with his ivories, Philip visibly crumbles in the run-up to a series of concerts and recording contracts that are about to cement his reputation alongside those of the greats. Conrad Williams spread before me Philip's rarified, cossetted and pampered world and the awesome talent of the pianist with precision, and balanced it all with the precariousness of a glamorous world peopled by plenty of shallow, self-serving prima donnas. If Philip is to reach the truth and honesty his musical interpretation is lacking then he must decide who to listen to, but he has some huge emotional hurdles to leap first and Conrad Williams has written a lyrical and passionate book that took me as near to the heart of this strange world as it must be possible to get. Not being a subscriber to The Gramophone, I was particularly entranced by the language of music appreciation, it's really like no other. One or two plot deviations head in unexpected and unusual directions but serve well to demonstrate that great musicians are as flawed as the next person and in that case normal human beings too, and I accepted these twists and turns very much as an integral part of the novel. A great deal in this book serves as a reminder of the potentially fickle nature of fame and fortune, breeding as it does its own unique set of problems. This is all enough to make a musical klutz like me head for iTunes and start downloading the Waldstein Sonata, the Chopin B Minor sonata, Bach's A Minor Prelude and Fugue, the G Major and B Minor Rachmaninov Preludes Opus 32 et al just to hear that concert as I read. An Equal Music by Vikram Seth does indeed come with an available CD of the music in the book and has certainly contributed to the fact that I have now read that book three times. I'm not placing The Concert Pianist in quite the same league but it really should have its own CD too.